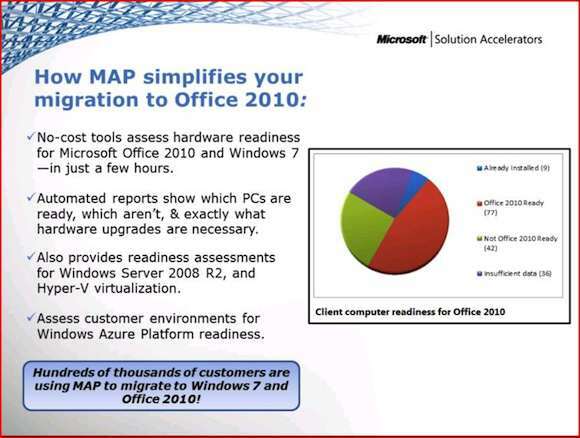 Microsoft reports the take-up of Office 2010 is the fastest for a software product in the company’s history. All well and good, but some doubters remain. Microsoft is keen to mop up migration and has assembled a bag of tools to smooth the process. The company’s in-house tech evangelist, Simon May, refers to Office 2010 migration as “the armadillo upgrade”: perceived to be hard on the outside but in fact easy on the inside. The key lies in good preparation. “You have to know what you have and what your environment is like so that you can avoid compatibility issues," May says. For example, he asks, how many Visual Basic for Applications macros do you have in your current environment? How many of those won’t be compatible with the new version of Office/Excel? How many of them are business critical? This is not something you want to be running around fixing after the fact. And there is no denying that some legacy hardware just won’t have the oomph to run the latest version of Office. Which machines, and do they have to be abandoned or can a bit of hardware triage get things working? Enter the migration tool kits. First up is the Microsoft Assessment and Planning toolkit, designed to provide a detailed view of your environment. It gives you a breakdown of the various Office installations you have running and will tell you which machines can run Office 2010 in their current configuration. It also details which machines need upgrades to be able to run 2010 and what those upgrades are, as well as flagging machines that it can’t access. Once this is completed it produces a word document report to help you explain to the higher-ups what needs to be done. You might want to tweak it a bit to tone down the evangelising of the product set, but the information is all there in management-friendly form. You might also use the Office Environment Assessment Tool to, yes, assess your office environment. This one scans your machines for add-ins and other applications that interact with various versions of Office and flags any compatibility issues. It also reports on your hardware status, highlighting machines that are in need of upgrading. Next up, there is the Office Migration Planning Manager (OMPM). This scans for potential issues with file conversion (from Office 97 and 2003) and macro compatibility issues, saves the data and begins converting files to Office 2010 format. This tool used to have a bit of an over-reporting problem, finding possible conflicts with ten times as many macros as other tools. The issue – caused because it looked for conflict with every single piece of the Office suite, not just the program needed to run a file – was fixed in August, according to this blog post. 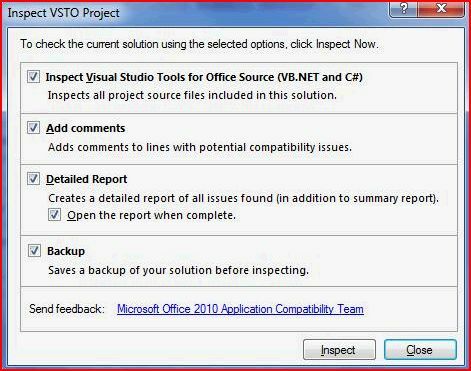 But if it still makes you nervous there is another tool you can use, either to whittle down or double-check the results from OMPM, or on its own: Office 2010 Code Compatibility Inspector. This is designed to inspect code that will run in Excel 2010, PowerPoint 2010, Word 2010 and Visual Studio 2008. It doesn’t check Outlook or Access but it looks at code that will interact with the Outlook object model. Where it finds issues, it makes a note via comments in the code, but you have to make the changes yourself. The comments can be automatically removed once you are done. There is a useful FAQ about all three of the compatibility tools here. May also directs potential upgraders to the Microsoft Deployment Toolkit, designed to help automate deployment of various software packages, including Office 2010, as part of the operating system. The bottom line, according to May, is that although an upgrade can seem difficult at the outset, it doesn’t have to be.